Access files created using 97/2000/XP/2003 can be recovered with Open Access Files tool. Open Corrupt Access Database recovers MDB files without overwriting or altering any thing on the original Access files. MDB Recovery tool to repair mdb file & fix Access database to perform mdb repair. 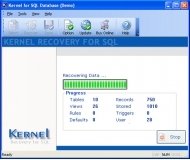 Recover Data for MDB Recovery Tool to recover MDB file as its simple and fast to use software, included only few steps to recover mdb files.